The following interview is with Sharon, interviewed by her daughter Rebecca Huehls (age 33). 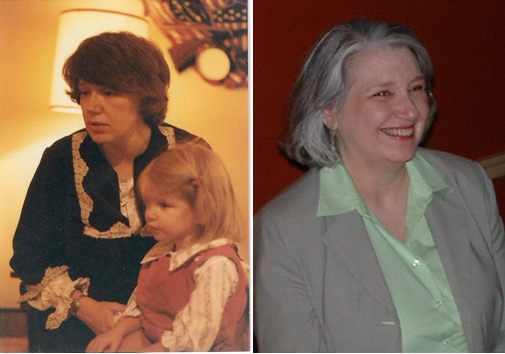 I turned 33 in November 1979, and we moved into the house where we are still living in September of that year. Except for a couple of months, I have never lived anywhere else but the Southside of Indianapolis. What has been interesting, though, is reading about other places; having many people from other places like Korea, Japan, Tunisia, Brazil, Turkey, etc. stay with us as homestay students; and visiting around the world. So I’ve been able to stay put and also see the world. What did you do for work and/or what was a typical day like? I had four children, ages 8, 7, 2 (Rebecca), and newborn. That was enough work. I found rearing children very rewarding, but I could have used some help. A typical day was to get up whenever baby newborn cried, change diapers, nurse the baby, corral the 2 year old, get the grade-schoolers up and out the door, and feed the 2 year old. Then I usually had some time to get my own breakfast, chat with the 2 year old, read some of the newspaper, and clean up the morning disorder. Then I nursed the baby while snuggling with the 2 year old and had both take morning naps while I figured out what to have for lunch and supper and did some laundry, and maybe read the rest of the paper. When the kids got up, I changed diapers, nursed the baby while reading stories with the 2 year old. Then usually the baby would hang out on a blanket or in a swing while the 2 year old and I did something together. During afternoon naps, I got dinner set up and did something by myself before naps were over. Then the grade-school kids came home, and there was usually a fight. When those were settled, I finished dinner, ate dinner, cleaned up, and did something with the grade-schoolers. After the baby and 2 year old went to bed, I made sure the older kids did their homework. Then it was bedtime for them, and I had a little time to do something else, maybe. Money; there was huge inflation going on at the time. Some mortgage rates were in the teens, and the price of everything went up almost daily. It was difficult to plan, but some sort of planning was required anyway. I didn’t know. That was the second thing I worried about. The pressure against having children was intense, and I got many nasty remarks. I felt I should have a paying job, but also felt that since I was the only parent reliably at home, I needed to be there. My husband was frequently gone with his job. I also tended to live in my mind and think about things endlessly, which is often not a good idea. At the time, a nuclear confrontation with the USSR was still a real possibility hanging over everyone’s head. In addition, the OPEC nations were beginning to be a threat to the world. I wasn’t completely sure that there even was a future. I marvel at how much energy I had. I wish there had been the Internet with its discussion boards and the ability to find out so many things quickly, without having to go anywhere. It was an interesting age, but with many uncertainties. I had always thought that adults just knew how to do things. It was a bit of a shock to discover that life is a continuous work in progress. What would you tell your 33-year-old self now? Do the best you can with the knowledge and ability you have available. Not letting anyone talk you into having an abortion was absolutely right. Many things are out of your hands, so don’t feel responsible for everything and everybody. The world has been and always will be dangerous; it is the type of danger that changes. Courage is necessary. Suffering or difficulty of any kind is not the worst; lack of love is. Small things done with love and care matter. Don’t feel badly about taking care of yourself, even though you may have many responsibilities to others as well. So glad to hear this! Thank you so much for commenting and spreading the word. Very appreciated. To Sharon: You look better now than you did then! To Jane: Thank you, again, for this series. I can’t always describe why, but reading these makes me feel good.